Bull Sails in Europes wind capital Tarifa has probably one of the most friendly owners and personnel you can imagine. Without asking we were given a guided tour in their workspace and their Research and design are. A very nice offer as it is not by default that you get to see everything. The owner was also very open about the position of his brand. “It’s for the people who want something else than everyone else already has.” Except that their kites are not widely known and therefore very rare on the water in most places outside Spain, there is another fine thing about Bull kites they cost a lot less then most other kite brands. We already tested the Joker from Bull. No we were able to test the colourful ZigZag 2015 (fifth edition). This so called do-it-all kite is according to Bull the perfect one-fits-all solution kite. 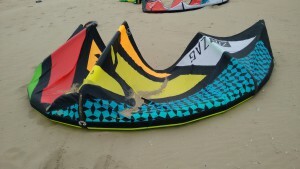 With nearly 900 Euro’s this is one of the cheaper kites we have tested so far. The ZigZag is (just as the Bull Joker and the the Slingshot RPM) two different kites in one. It all has to do with the bridle setting; put the bridles in the outer settings (1) and it is at its twintip settings. Put it at the inner (2) connections and it becomes a wave kite. Those few centimetre make so much of a difference that it is quite strange it isn’t explained anywhere on the Bull website. Too bad also the bridle resetting takes about 15 minutes. This can be easily reduced to one minute if the connections on the kite where not loops but knots (see the reaction of Bull below the review). The kite in general has, with its multicolour and bull horns, a very recognizable look. For the older generations this kite will give some vintage feelings. The small in- and deflate is an example of this. It does have a good working one pump system, no battens at all and as seen before the advised 5 psi pressure is not the amount of pressure it needs. 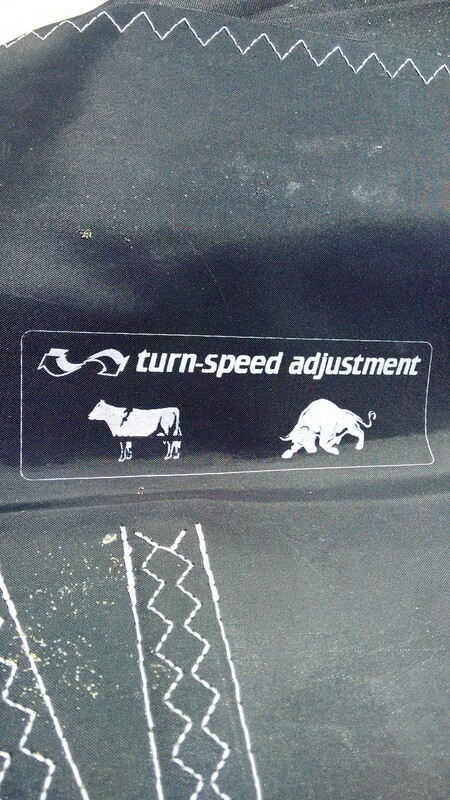 This should be way more, as we also understood by asking Bull. To get some stability from 5 strutted ZigZag you should pump it around 8 to 9 psi. The back lines can be set at three different settings. Since the bar pressure is slightly a bit higher than average (for example the F-one Bandit, the North Dice but lower than the Peter Lynn Escape) we had set the back lines on most of our testing at the fast setting. The Bull Power Bar is the same for all kites from Bull, so as we reviewed this with the 2015 Bull Joker, the results for the bar and lines are the same. It comes with four 25 meter (on request the length can be altered) lines and has a neat and unique swiffel system which, -like most other swiffels- doesn’t work properly on it’s own. It has a stopper ball which can be moved on the fly. The safety system is similar to most other bigger brands and won’t give any problems. The depower line cannot be twisted which would have helped to untangle the front lines. Suicide mode (for unhooking) should be done with a large leash hook (standard leash like those from F-one or North won’t fit), like the leash from Gaastra and should be connected both to the chicken loop and the safety system. The depower system comes underneath the bar next to the chicken loop. It handles a bit better than for example the Naish version, but it isn’t our favourite since it takes some effort to pull it to the right amount of depower. 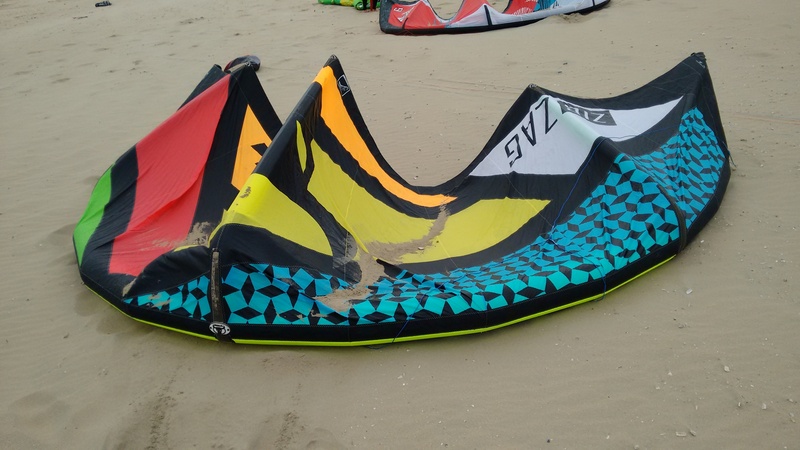 The ZigZag gave one of our testers the best wave experience he ever had.When riding a wave the kite is amazingly at ease when set in the right position. It is quite well balanced and won’t fall out of the sky when there is no pressure on the lines. The ZigZag can be ridden quite easily with one hand. The pull, when sheeting in, comes with a very predicable build up pressure and can be described as soft in general but can be created to a certain amount of extra pull if needed easily. We have ridden the 10m ZigZag even with as little as 16 knots of wind but we didn’t notice any back stalling or dropping out of the sky and it was still usable for wave riding. Compared to the Bull Joker the ZigZag is a bit smoother and thus a bit less radical. The effect of the different settings for the ZigZag are less pronounced than we experienced with the Joker. The ZigZag with the bridle at the outer settings gets the kite to a mellow and almost peaceful ease. The large leading edge clearly takes it positive role at the low end side of the wind range and brings a nice powered feeling. 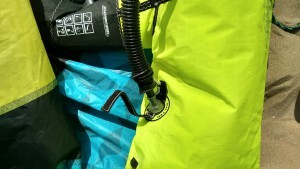 A 80kg rider on a twintip can have enjoyable sessions with the 10m Zigzag from 17knots easily. With more wind (22+ knot) the kite was less at ease and lacks some form of stability (maybe some battens in the trailing edge would help)especially when you make some agressive moves. Compared to the Best TS 10m (which will really start going at 22 knots), this 10m ZigZag is completely on the other side of the spectrum. The bar pressure is average till moderate but gets to heavy in our opinion when set to “cow” (slow).We wouldn’t recommend the ZigZag to attack the WOO sports jumping height leader board, but it does give a good fun sports feeling riding it in moderate winds. Moderate jumps are easy due to it’s clear pop moment. More aggressive (unhooked)moves are easy to learn, but won’t give that direct feel an intermediate rider needs. The kite gives an easy but medium pull and the ZigZag is close of pivoting around its axis if you make kite loop. Going upwind is not the best aspect of the Zig Zag but on the positive side the kite isn’t as slow in reacting as the large leading edge would suggest, but it is still far from quick. Changing the bridel setting is something rarely done and then those 5min. are ok. a knot is much more risky and if it opens it might end up in a big problem. to be honest. I prefer the safe way.